Or, After Action Review for Parks as Portals to Learning–just a little taste of the ways in which military culture informs the history and present operations of the National Park Service. 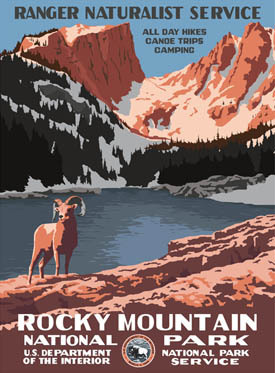 My week up in Rocky, or ROMO (=ROcky MOuntain), another acronym used by Parkies, was a rich learning experience. As a seventeenth- and eighteenth-century Eastern historian my expertise was fairly irrelevant, but I took the opportunity to learn about how the NPS works. Besides keeping up with all of the military- and government-style acronyms (EIS, NEPA, EA , ETC) for the laws and procedures that structure the park’s conservation work, faculty from Colorado State and UC Santa Barbara helped CSU students think through the ways that environmental history informs and can assist natural resource preservation as well as the interpretation and visitor experience of the park. The park managers that we met with on our first few days of the project, most of whom come from natural resource backgrounds like ecology and animal biology, were all generous with their time and offered to mentor any students who want to get into the NPS. In contrast to academia, where mentorship is an ideal but doesn’t necessarily lead directly to a particular job or career, the NPS is like any other government agency: if you get an internship or a seasonal job, meet a few people, and impress them with your work ethic and your ability to work as a team, you can find mentors who will help get you a permanent position. 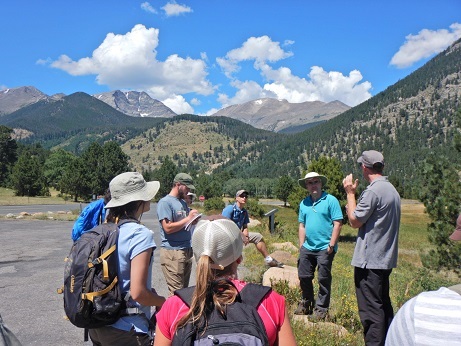 This was all along one of the goals of Parks as Portals to Learning–facilitating relationships between our students and NPS staff to help them establish NPS careers, as well as showing Rocky staff how human history is relevant to their work as public lands managers and interpreters. Interestingly, the Denver Post ran a story this morning about the Superintendent of Mesa Verde National Park, Cliff Spencer, headlined “NPS Superintendent started as an intern.” The career path he describes in this interview is just another version of the stories we heard again and again from the Parkies up in ROMO. The students prepared a Story Map of Horseshoe Park, which is just inside the Fall River entrance of Rocky and among the most intensively used spaces by human beings. However, most traces of the human history of Horseshoe Park were removed or destroyed. As a natural resources park (versus a historic park like Independence National Historical Park–in Parkie lingo, “INDE”–or Adams National Historical Park–“ADAM,” natch), evidence of human habitation and activity has been treated like an invasive species. But in fact the area was home to a ranch in the 1880s-1906; a Dude Ranch for park visitors from 1906-1931; and a Civilian Conservation Corps (CCC) camp from 1933-1942. Horseshoe Park has also seen tremendous changes to its ecology and management by humans as well as inundation by floods in 1982 and 2013. The Parkies they met with turned out for their lunchtime presentation on Friday afternoon, in addition to several other staff and volunteers. The six students did a fantastic job in just two and a half days of research and planning that kept them up past midnight Thursday as they polished their work. It’s a rough ride as an advocate for cultural resources in a natural resource park like Rocky, but I think the work our students did may have helped to bridge this divide. As for me? I came away with lots of ideas for turning my material culture students in fall 2017 loose on the Mission ’66 collections in the ROMO archives. I’ll say more on the controversy of Mission ’66 architecture and material culture another time, but just leave you with this: I love Parkitecture, but let’s face it: all material culture is a product of a particular place and time, not a natural or timeless expression of aesthetic values. 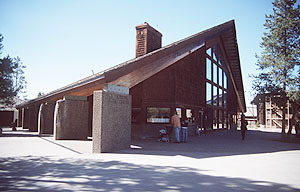 Old Faithful Visitor Center, 1968-70, to be demolished under current General Management Plan. There’s nothing intrinsically more harmonious about buildings built in the early twentieth century as opposed to the 1960s or the 2010s. 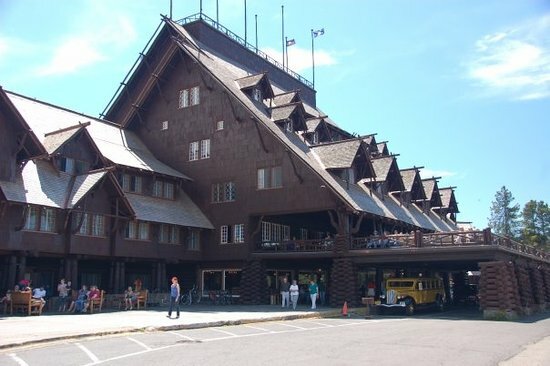 The NPS should proceed with caution in its decisions regarding Mission ’66 buildings, which reflect park values and American ideals in the postwar heyday of automobile travel in the 1950s and 1960s. I would have thought that Mad Men-chic in the past decade would have infected the NPS, but as the human history of managing nature parks lengthens, it’s up to historians to persuade them to see humans and the contributions they make as a native (as opposed to invasive) and necessary part of park heritage. if you get an internship or a seasonal job, meet a few people, and impress them with your work ethic and your ability to work as a team, you can find mentors who will help get you a permanent position. As an NPS employee, that makes very little sense to me. Given how few jobs there are, and how skewed the hiring system is towards veterans who often have little subject-matter expertise, I really don’t know how I can help anyone get a permanent position. I have no jobs on offer in my division, and while I know people in other parks, they’re just as constrained by our screwed-up hiring system as I am. I’m happy to mentor people if I can, but I have very little ability to get someone a permanent job at a living wage (which seasonal jobs aren’t) – and I suspect that’s the same for many other folks. Thanks for your comment here, Ed. That’s an interesting point about the vets, of which we met a few in passing. But in Rocky. among the top managers, most people seemed to have a very theoretical & academic background with a great deal of specific subject expertise. Maybe that’s unusual? I don’t know–I’ve only ever seen behind the curtain at one park, Rocky. Great report, Historiann. Parks can, indeed, be excellent “portals to learning,” and–I never thought I’d ever be saying this back when I separated–the agency actually does listen and learn, although there is a rather iron-bound layering of jargon and process mentality involved that can be frustrating to everyone. On the mentors-to-jobs part, while I think it’s maybe a *little* bit more complicated than the sentence you offer may suggest, in fact, initiative and hustle can indeed get noticed and rewarded. The guy whose notice got me from a short term to a very long-term position (it never became permanent, but it wasn’t seasonal either) was actually philosophically hostile to the project that I had been sent to “his” park to carry out, but he was fair, and he made distinctions between the bureaucratics of things and the rest of it. One of my best students, whose B.A. was wrapped around two long deployments to Iraq and one to Afghanistan, did some aggressive volunteer and seasonal work, and he just literally last week “got on permanent” at a small park in the middle of nowhere. I told him years ago he would probably be a superintendent someday. There are unquestionably gender issues and dynamics embedded in the agency’s culture, and it is indeed in some ways a para-military structure, as the comment above suggests. But while I drifted back to academia, my overall estimation of it has largely improved as the inevitable stings of relentless bureaucratic conflict have faded to indistinct scars and slight limps. HAhaha!!! So those four-letter park acronyms have a long history indeed. Another acronym I should have mentioned: WASO (short for Washington Office?) in Fort Collins. Has something to do with collecting and comparing NPS data from all park sites, I think–it’s a national office, not a local or regional one. WASO is the Washington Office. It is the province of the NPS director, and all operations report up to and through it, to some assistant secretary in the Interior Department, as in all governmental agencies. One difference is that there were National Parks (beginning with Yellowstone) long before there was a central agency. Most were managed by the military. And since parks are theoretically (and in large part actually) selected for idiosyncratic not generic reasons, they’re not like Social Security or any other agency “store front” service delivery points, i.e., pretty much fungible across the country. So a lot of power has remained in the hands of park superintendents, in ways that would not be the case with the manager who is running the local storefront Social Security office, or whatnot. When I worked at MARO (Mid-Atlantic Regional Office–no longer existent–in Philadelphia), its building was physically in and a part of Independence NHP. So the superintendent of INDE was in a sense the landlord for his technical boss, the regional director of MARO. And he was very politically savvy locally, despite having a much smaller physical office down the street. Which is why the regional director soon got kicked downstairs to be the superintendent at Rocky. Or something like that, it was a long time ago. Thankfully for Diderot, he didn’t have to sweat out editing an article or an entry on this subject for the Encyclopedie! If it’s still there or even exists, an interesting Park Service enterprise in your neighborhood, Historiann, is the Denver Service Center, located at the Denver Federal Center in Lakewood just west of Denver. It did a lot of the non-uniformed, professional, disciplinary, service-wide project work, especially general management plans and the like. Teams of disciplinary specialists were assigned to time-specific projects in and out of individual parks. There were some complicated bureaucratic and cultural tensions between this office (as well as the Harpers Ferry Center, in W Va) and the parks that these teams served. But as I say, maybe it’s gone the way of the Pony Express or the Civil Service Commission.